Of course your Zijlsloep can be adjusted any way you like. 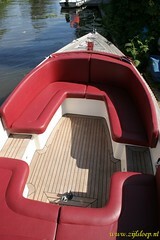 For starters you have a colour scheme to choose, for the hull, the seats, sail covers. And each extra that comes with the Classic model can be ordered separately. Propeller: the Zijlsloep will be delivered with a fixed prop, but you may opt for a folding propeller. That will create less drag during sailing but it often is less efficient as prop. Boat covers: instead of the (Basic) standard ship cover you can for example choose a two-part convertible cover or a tent over boom and deck. 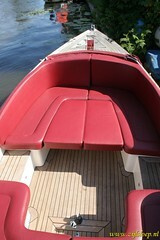 A classic ship or convertible cover can be used in combination with a boom cover to protect the sail. Boom cover and convertible cover are standard on the Classic model. Engine: under usual conditions the Zijlsloep (almost) reaches its theoretical maximum using the standard engine. Under sail the ship does reach the top-speed, some 9 km/h. A more powerful engine is possible but does little in the sense of speed increase, because any ships maximum speed is limited by the (water) length of the hull. Batteries: if you consider running longer than several hours on the engine, an extension in batteries is rather easy to implement. They will be installed in such a way that the load is evenly spread over the hull. 'Sun deck’: a method, familiar from the non-sailing 'sloep' (or civilian liferaft), to allow passengers to stretch comfortably across the front benches. This feature is standard on the Classic model. Other options: set of two fenders, sun deck (standard on Classic), folding anchor, swivel barbecue, 12V car connectors (set of two for smartphone, tablet, laptop, GPS), barge pole, boat hook or a road trailer? Ask as to what you'd like on board.